For almost two years now Triple Double Prospects have been ranting and raving about the talent in Ohio’s class of 2016. That class, who is made up of prospects who will be high school juniors this coming season, is not only loaded in terms of quality at the top, but also in quantity of mid and high major division one prospects. Thursday night marked a special day for this class, as the first Ohio prospect came off the recruiting board. Medina center Jon Teske was that player, as the Cleveland area junior committed to the Michigan Wolverines, announcing his decision publicly via his Twitter account around 8 PM. After starring at Medina as a sophomore, Teske impressed college coaches this spring and summer with his Team Work AAU team, prompting Michigan head coach John Beilein to extend a scholarship offer, as well as the in-state school, the Ohio State Buckeyes. 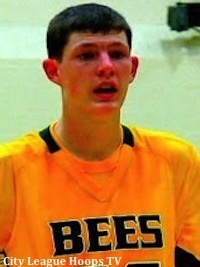 In the end, Teske chose to play his college basketball in Ann Arbor, Michigan, choosing the Wolverines over rivals Ohio State, Purdue, Indiana and Notre Dame. A skilled 6-foot-10 post with considerable offensive upside, Teske is a very good passer and finisher with his back to the basket who can step out and shoot the ball with range comfortably. He is still in need of adding considerable weight before he is ready to battle in the rigorous Big Ten every game, but the height and offensive feel for the game that Teske has is not something that coaches can teach. Also a hardworking player who is known as an above-average shot-blocker and good floor-runner, the Medina product has shown consistently that he has the athleticism for his size to be a threat in the Big Ten. This skill-set makes him a hand-in-glove fit for Michigan, who has built a top-tier program around fundamentally sound players who will buy into playing an unselfish offensive style. Additionally, Michigan has also made their southern neighbors priorities in the recruiting game, as Beilein has signed stars like Trey Burke and Caris Levert out of the Buckeye State since taking over for the Big Blue. While Teske is the first 2016 prospect out of Ohio to commit to a high major, he definitely won’t be the last, as he is part of a class that will likely send several prospects to the Big Ten or similar conferences. Currently ranked as Triple Double Prospects top ranked center in his class, look for Teske to emerge even further into the spotlight in his junior season, especially after the departure of former Medina star guard Craig Randall, who moved with his family to Arizona for his senior season.